Show your unique fashion sense in this adorable short wedding-guest dress with trendy details. Well-suited as a day-to-night dress, this style is appropriate for cocktail parties or dinner dates after the work day is through. 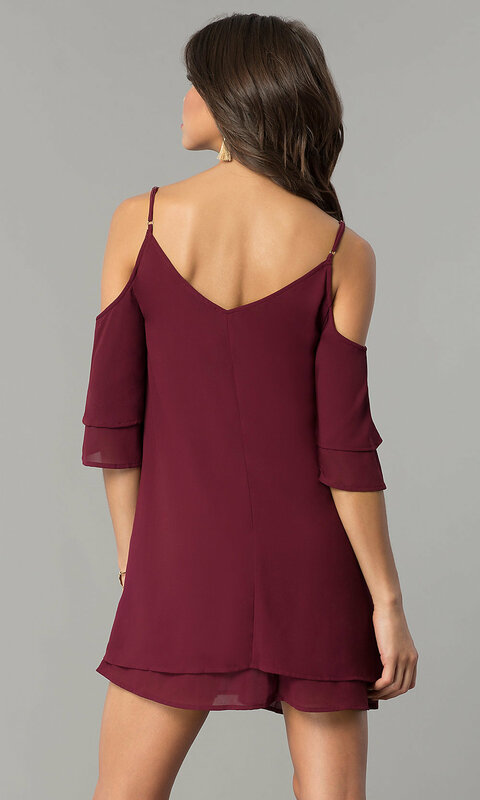 The cold-shoulder party dress features tiered bell sleeves that drape over the arms to elbow length. The figure-flattering shift dress flows away from the hips in layers of silky chiffon that end in matching tiers at the short hemline. Side pockets safely hold your valuables making it convenient to leave your purse at home if you decide to hit the dance floor. Under $50, this short wedding-guest dress is a budget-friendly style that gives you unrestricted movement for your semi-formal event.